About an hour and a half’s drive east, the rolling agricultural land around Bentonville rises into steep Ozark hills. 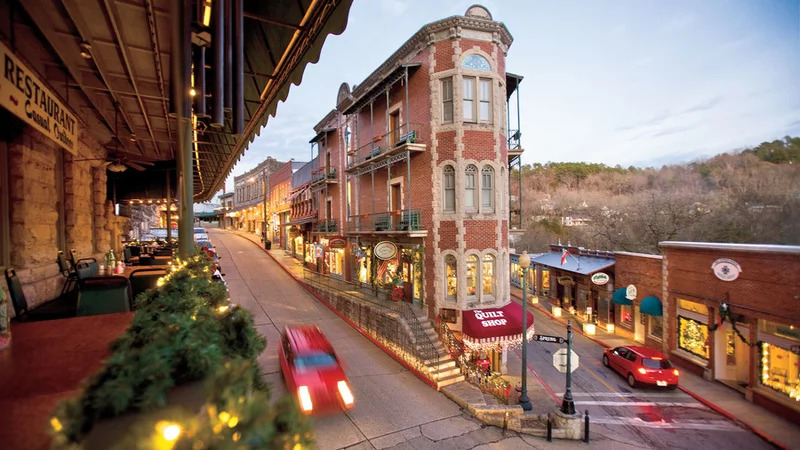 With a population of just over 2,000, the Victorian resort village of Eureka Springs has an outsized presence in the American imagination as a popular vacation destination unlike any other. The entire place, once called the “Stairstep Town” because of its steep terrain, is on the National Register of Historic Places. Eureka Spring’s vertiginous, winding streets are filled with Victorian-era cottages and manors; the historic downtown is home to a number of grand hotels, including the Crescent, built in 1886, and the 1905 Basin Park. Long before it was known as Eureka Springs, local tribes would visit the area for the waters of the Great Healing Spring. Later, European settlers, too, believed that the area’s springs had healing powers and flocked to the town’s bathhouses for spa treatments. Of the more than 60 springs that brought all those hordes of 19th-century tourists, most are unusable today due to pollution and mismanagement. The springs may have dried up, but tourism has not. Today, the largely intact Victorian village is ringed with swaths of motels, barbecue joints, souvenir shops, psychic studios, nail salons, and fast food restaurants. Most people come for the history and the charming architecture — but others come to commune with ghosts. 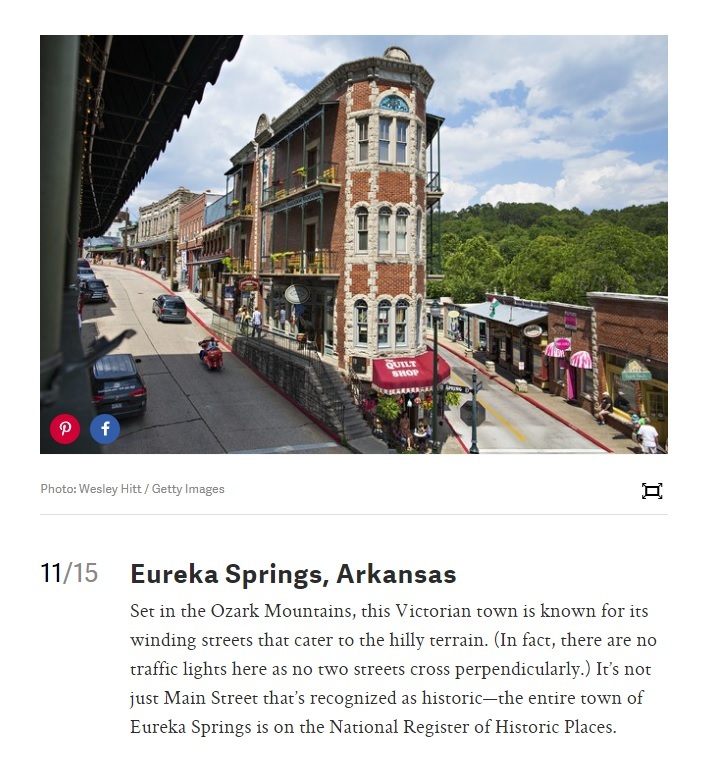 The Victorian-era town of Eureka Springs. 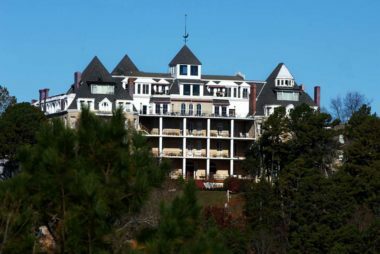 Any town with a collection of large old hotels is bound to harbor a ghost story or two, but Eureka Springs embraces its stories with a passion: This is one of the great ghost-hunting destinations in the United States. There are moonlit (and daytime) tours galore, and lots of supernaturally themed products are for sale in the shops. When I mention to the desk clerk at the Basin Park Hotel that strange late-night sounds had come from the floor above, she confidently (and perhaps a bit gleefully) attributed them to spirit activity. 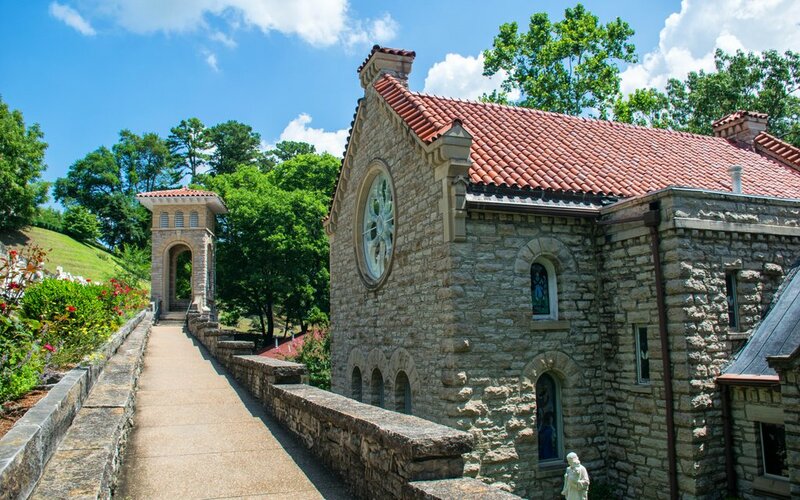 For those seeking a more spiritual experience, there is the seven-story statue, Christ of the Ozarks. Erected atop Magnetic Mountain, the statue is comprised of 24 layers of white mortar on a steel frame and weighs more than 2 million pounds. Nearby, The Great Passion Play greatpassionplay.org is staged in an amphitheater. Patterned after the original in Oberammergau, Germany, the outdoor performance runs through October and features a cast of 170 actors and dozens of live animals. To date, an estimated 7.7 million people have seen the production. 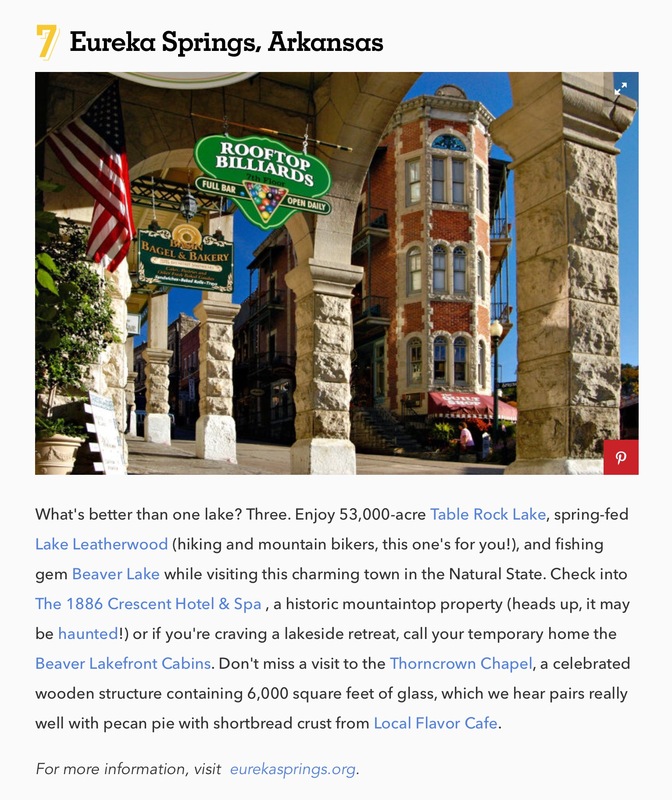 The quaint town of Eureka Springs, AR, is boasting with activities: zipline down Ozark Mountain; paddleboard on Beaver Lake; take a hotel ghost tour; taste local wine at Keel’s Creek Winery; cross the Pivot Rock Natural Bridge. Amazing! Spend Christmas in Eureka Springs for an unforgettable holiday season. Don’t miss the Eureka Springs Christmas Festival, Silver Tea at the Crescent Hotel, a downtown Christmas parade, and the annual Christmas tree lighting. The kids will love an afternoon with Santa (and reindeer games!) in one of the town’s charming parks. This small town promises music and merriment a-plenty. 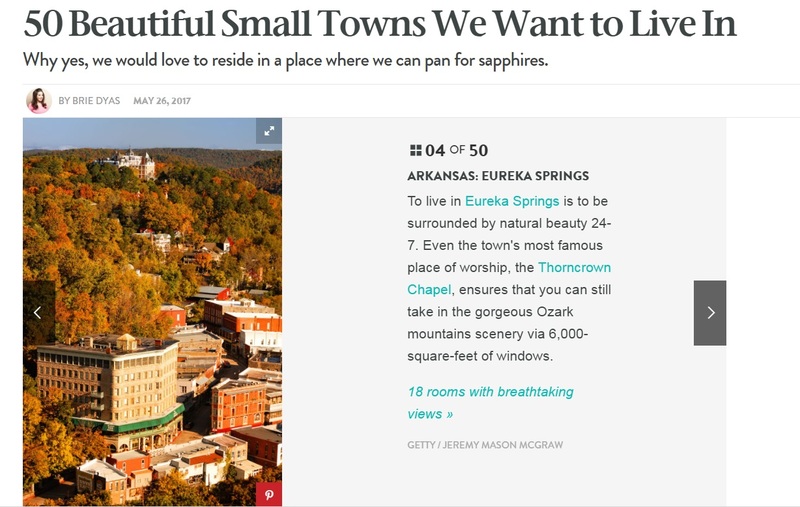 Arkansas isn’t on many people’s radar when it comes to vacation destinations, but Eureka Springs is a small town that shouldn’t be missed. 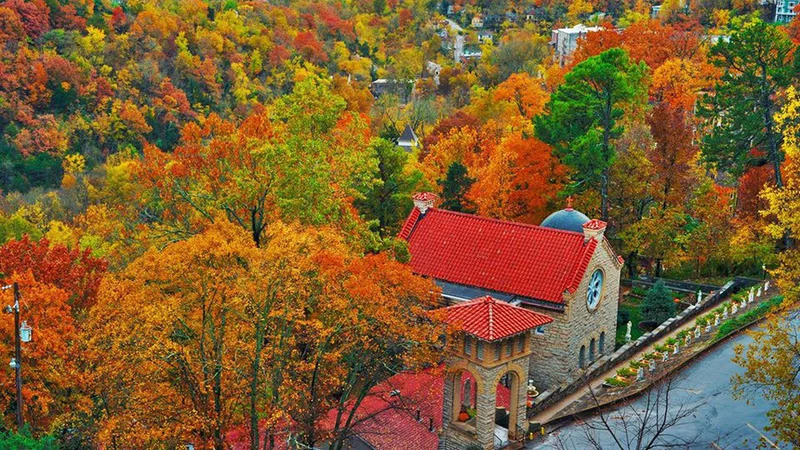 Nicknamed “The Little Switzerland of America” and “The Stairstep Town,” Eureka Springs is a tiny Victorian town nestled in the Ozark Mountains. While the entire city is less than seven square miles, there’s plenty to do and see, like browsing the more than 100 local shops and galleries, visiting historical buildings such as the Thorncrown Chapel, or exploring the underground onyx cave parks. After a busy day, try out one of the town’s multiple award-winning restaurants that serve everything from Indian to Czech-German to Mediterranean fare. A new study suggest mismatching your cuisine leads to a more enjoyable meal, so consider heading to the Indian restaurant for dinner and the Czech-German for dessert!